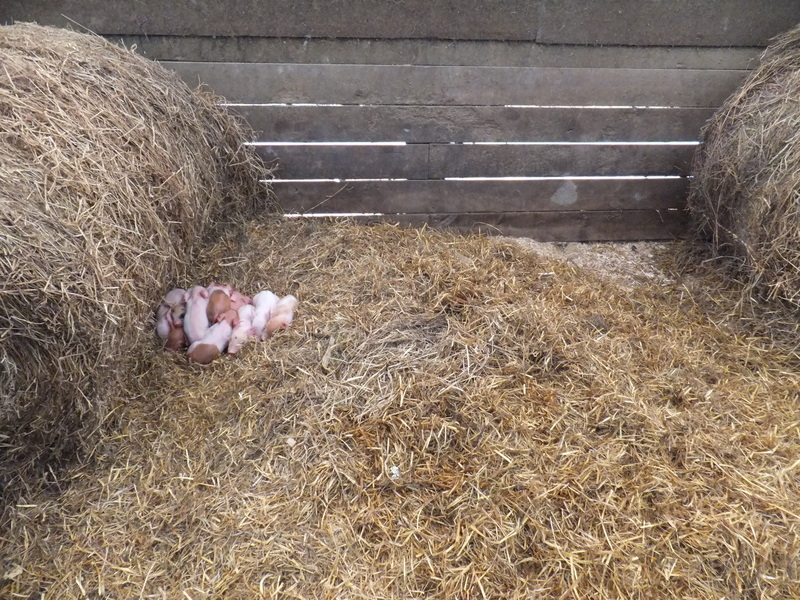 I knew sows make nests before they farrow. I didn’t know they spend so much time and effort on their nests after they farrow. Look at this gilt raking the bedding with her front foot. The bedding was more or less even, but she took one side of the pen down to the lime chip layer, and elevated the other side a foot or more. This had to take hours. 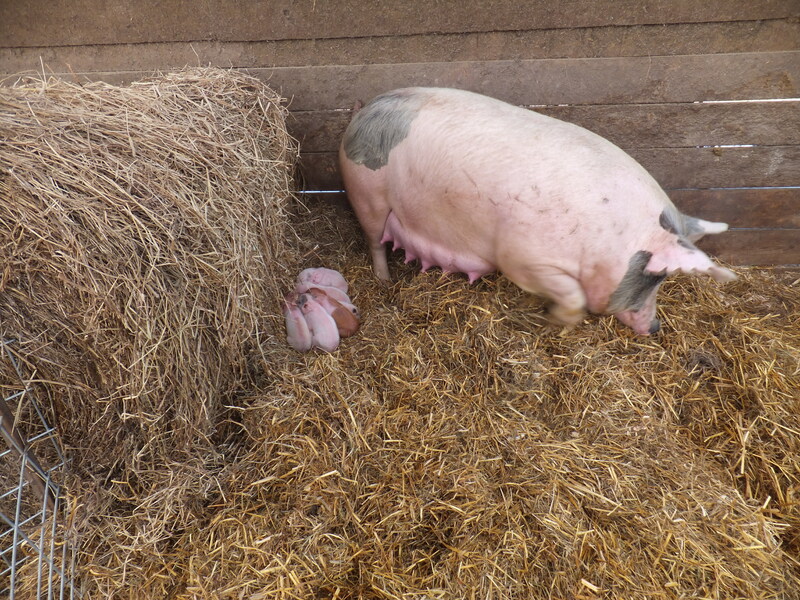 I watched one gilt tear bedding off a bale with her mouth and carry it to her nest. All of them do it to some extent. Below is another picture showing a litter in an elevated nest. This entry was posted on Thursday, February 2nd, 2012 at 12:21 am and is filed under Curious hogs. You can follow any responses to this entry through the RSS 2.0 feed. You can leave a response, or trackback from your own site. There was a BBC production called “Victorian Farm” where a group of historians tried to run a farm using only Victorian tools (sooo labor intensive) they had Shropshire (sp?) 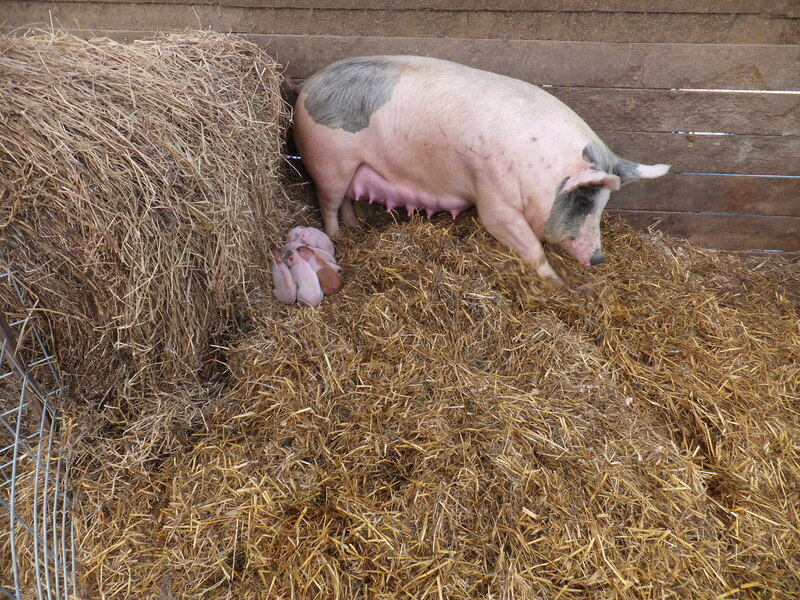 pigs, a historic breed, that roamed all over the farm, and they knew when the sow was about to birth because she ran all over the farm collecting materials to make a nest out of one mouthful at a time. The behavior was so birdlike it was astonishing. One of the things I learned from all the experiences I had with the neighbors hogs was just how smart they really are. That would be when I learned first hand about the new way of fencing with electric fencing….back in about 1970 or so….Ya just don’t whiz on a weed unless you’ve looked it over…..when they would castrate the young males, they used a barrel of oil, and dipped the hindquarters in it…it worked, is all I’ll say…sure was loud though. We raised sheep and they too would paw the straw while in labor. They would eventually clear a nest, so to speak. My children also raised rabbits, and the does would pull wool from their stomachs to build their nest. I remember a day or so before I went into labor with our first child, I got into a cleaning frenzy around the house. Definitely unusual for me. My father-in-law, a dairy farmer, said I was “nesting” and the baby would come soon. I thought he was quirky, but sure enough, he was right. dl, that is a really funny story! Thanks for sharing.